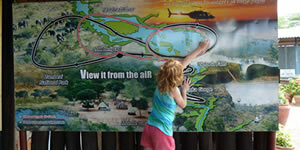 Boasts Kamp Kwena which is a complimentary activity/ entertainment programme for kids between the ages of 3 and 12 years. We often get asked about taking kids to the Falls and "will adults still be able to experience Vic falls with a child around." You should know first up that the Falls themselves are not a toddler or small child-friendly destination at all. Outside of the viewing point area's, there are no secure fences and many wet steps that go down a very long way. We went with our kids when they were aged 5 and 7 and although there were few nervous moments, they were warned enough times and understood where the dangers were. Much younger than 5 and I would recommend not letting them off the end of your arm until you are well away from the Falls area. The good news is you have a holiday town where all the adventures and activities are relatively close to each and within a relatively close driving distance. There is a lot of exploration to be done with kids in the area. The obvious one is the walk along the paths surrounding the Victoria falls which are quite well signposted and pretty safe if rules are adhered to. There are great vantage points all along the paths and kids will stand for ages just staring t the sheer volume of water all going into the gorge. They will also love the running around in the "rain forest" getting soaked by the mist coming off the waterfall. The one drawback to Vic Falls is obviously the Malaria issue and if you fly in through Livingstone on the Zambia side you need to have had a Yellow fever Jab at least 10 days before you arrive too. You need to consult your local travel clinic to get advice on what Malaria medication best suits your family. medication usually needs to be started a few before your trip and needs to be continued a few weeks after as well. Be sure to take plenty of mozzie spray as well and we found that the electronic deterrents available from the local camp shop also worked very well. the clipped onto the kid's shirts and kept the mozzies away. So what can children do at the Falls? The Kingdom Hotel in Zimbabwe and the Zambezi Sun in Zambia are the most child-friendly of the hotels in Victoria falls but I am also going to add Victoria Falls Safari Lodge.